All signs point to Carmelo Anthony and the Thunder parting ways. Once Anthony officially becomes a free agent, where should he go next? The Lakers and Rockets stand out as obvious destinations. The Carmelo Anthony Era in Oklahoma City is approaching an unceremonious end. Anthony and the Thunder are expected to part ways this summer, either via trade or buyout, according to an ESPN report. The news is not too shocking—Anthony’s massive salary this upcoming season would trigger an absurd luxury tax payment for OKC. Either trading Anthony or buying him out and using the stretch provision could save the Thunder upwards of $100 million. The writing for Anthony’s departure was on the wall once Sam Presti re-signed Jerami Grant and picked up Nerlens Noel in free agency. So once Anthony’s exit is official, where does he go next? The hope for Melo when he signed in Oklahoma City was for him to approach the Thunder like his role on Team USA, or Olympic Melo for the uninitiated. In many ways, that held true. In his last four seasons with the Knicks, the most frequent type of shot Anthony attempted was the pull-up jumper. Anthony still shot his fair share of pull-ups with the Thunder—which helped contribute to his downfall—but for the first time in his career, he became a catch-and-shoot player. Last season, 42.4% of Anthony’s field-goal attempts were of the catch-and-shoot variety. The issue was he shot only 37.3% on five catch-and-shoot threes per game, which made him a slightly worse version of guys like Kevin Love and Ryan Anderson. During the regular season, Anthony’s defense was greatly covered up by often playing alongside Andre Roberson, Paul George and Steven Adams. 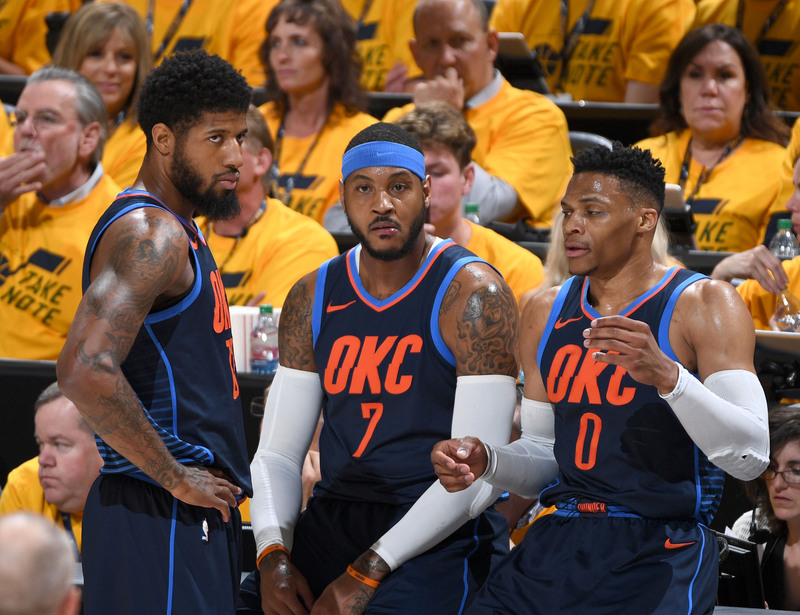 In the playoffs, without Roberson injured and the Jazz targeting him, Melo’s game cratered. The Thunder had a -15.6 net rating with Anthony on the court in Round 1 and a 17.2 net rating with him on the bench. Anthony’s defense was picked on, and on offense, he traded in some of his catch-and-shoot looks for inefficient pull-ups. To make matters worse, Melo went cold from three, shooting only 19% when spotted up beyond the arc. With that in mind, any team trying to work in Melo is going to have their hands full. He can still be a useful player, but managing his role will be important. Anthony only really makes sense on a contender at this point in his career—he needs an organization with a strong culture and respected leaders who can ensure he won’t try to do too much. The most obvious choices are the Rockets and Lakers, both of whom are looking for shooting, and employ Melo’s close friends Chris Paul and LeBron James. The Rockets were in the mix for Anthony last summer, and the team could take a flier on him if he gets bought out. Again, role will be important here. Subbing in Anthony for the departed Trevor Ariza would be a mistake, as the drop off in defense would likely be staggering. Anthony, who makes most sense as a power forward, also wouldn’t be a good fit next to Anderson, who was a key factor in Houston’s second most-used lineup last year. However, if Melo is willing to come off the bench, he would likely fare better. With the way the Rockets stagger Paul and James Harden, Melo would still be sharing the floor with another superstar. Against other backups, his defense likely wouldn’t be as exposed. Come playoff time, Melo would not necessarily have a significant role. But considering how much the Rockets’ rotation shrunk by the conference finals, a few decent minutes off the bench here and there would be more than welcome. The Lakers could end up wanting Anthony more than any other team. L.A.’s offseason has been underwhelming since bringing in LeBron, and Melo could solve one of their biggest concerns—outside shooting. James typically draws out the best in his supporting cast. And despite Russell Westbrook’s gaudy assist numbers, LeBron is the much better facilitator. Bron may be able to generate even cleaner looks for Anthony, which could help bump his spot-up shooting numbers a little bit. Also, if anyone can convince Anthony to give up his pull-up lifestyle forever it’s James. On the Lakers, Anthony would be surrounded by creative playmakers in Lonzo Ball, Rajon Rondo and LeBron, hopefully nudging him to commit to playing off the ball for good. Again, issues would surface in the postseason, and Anthony will have to be comfortable with his role yo-yoing depending on the matchup. Those really are the two clearest options for Melo. Maybe an East team swoops and tries to sell Anthony on a clearer path to the Finals. Maybe the Wizards continue their Stanford Team Chemistry Experiment. Maybe Giannis pitches Melo on a year in Milwaukee. Who knows, maybe the Warriors make a phone call just to troll Paul and James. Wherever Anthony goes, what his new team ends up asking of him will be more important than anything else. If Melo is finally willing to excise his pull-up game and commit to being a catch-and-shoot guy, he can add some value to a roster, though his minutes will have to be carefully managed in the postseason. It’s possible in a more comfortable environment Anthony could return somewhat closer to the star we saw in New York. For now, asking Melo to be anything more than a role player is a dicey proposition.